I ran "barefoot" for almost 9 miles in my super-fugly Vibram FiveFingers KSOs today. 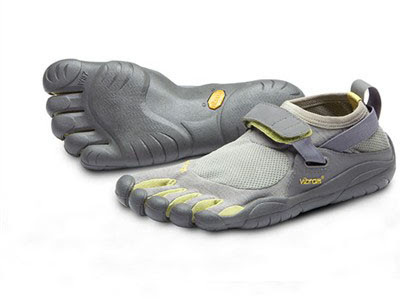 (I've previously written about my other pair of FiveFingers -- the Sprint -- here, and you can read reviews of them here and here.) The Ka'anapali beachfront was beautiful today, and it was oddly relaxing to get out there and just...go. I'd never attempted to run this distance in nothing more than what amounts to a pair of socks with a thin rubber sole, but my feet were surprisingly comfortable throughout (except for during a one-mile stretch of rock-strewn dirt trail). Afterwards, I chucked off my KSOs to check out my feet; the undersides were pink, but not blistered or particularly sensitive to the touch. My right knee, which has plagued me for years, didn't bother me at all, and I was shin-splint-free. And thanks to P90X, I wasn't winded or even tired after running over an hour. Despite having been a fairly regular runner in years past, I still know next to nothing about the "barefoot running" movement. But I've been reading about it in the New York Times, Wall Street Journal, and on websites like runBARE, and based on my experiences this week, I'm seriously considering adding barefoot running to my fitness routine.